/ Benefits of Kayaking; Why You Should Pick Up A Paddle! Kayaking is a sport that millions of people around the world enjoy. Whether recreationally or competitively, it’s a great way to get out on the water, take in the scenery, and get a kayak workout. But what exactly are the benefits of kayaking? Is kayaking good exercise? If you’re thinking of taking up your paddles then keep reading, because in this article we will be explaining what it is, and why so many people are such keen enthusiasts. One of the best things with kayaks is how adaptable they are to different situations. If you are kayaking for exercise, you have a variety of pursuits to keep things interesting. The majority of people who Kayak do so on flat water. This can be on a river or a lake, and provides a calm surface to paddle across without causing any issue with balance. Popular in hotter climates, sea kayaking is when you paddle out into the ocean. Choppy waves make this more exhilarating than paddling on flat water, but there’s a higher chance of capsizing. Kayaking can be very competitive, with sprint or marathon distances usually being the most common. When you are comfortable in the boat, this can be a great way to push yourself further. This is when you paddle a kayak down a white water rafting course. It’s exciting and energetic so provides a great kayak workout, but only for the more experienced paddlers. If you’re looking for a team game, then kayak polo could be for you. Similar to water polo, your team are in kayaks and attempt to get the ball into the goal. Kayaking will really get your heart pumping, and as a result will strengthen your cardiovascular fitness. It’s great exercising in the outdoors, and exposure to sunlight increases your production of Vitamin D.
The energy required to move the boat across the water is a great way to manage your weight (in conjunction with a healthy diet). Kayaking is a fun and peaceful activity, especially if you are paddling across calm water on a lake, for example. It’s the perfect way to leave the stresses of life behind and relax, helping you to de- stress. Kayaking involves using most muscle groups- whether it be the arms, back and torso from paddling, or the legs as you learn how to exert more power into your stroke. It can be quite an exhausting activity if you are racing or in tricky conditions, but even on flat water you will get a good workout that is ideal for helping to manage your weight, improve the health of your heart, or simply just to burn off those calories. If you’ve decided to start kayaking, then it’s worth joining a club so you can meet like-minded people to get out on the river with. 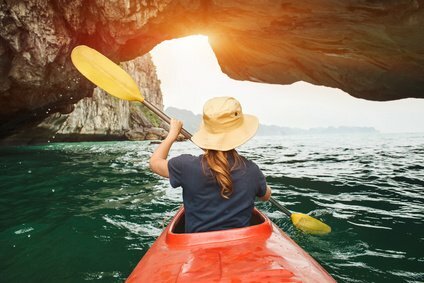 You’ll also be able to learn the best technique and have a chance to try it out before committing to purchasing a potentially expensive boat., The only pre-requisite to kayaking is the ability to swim, just in case you end up in the water. It’s nice to know more about the slalom kayaking, which can also be called as white water rafting and is an exciting activity for both beginners and experienced paddlers. My wife wants to take on an adventurous activity for our summer getaway. I’ll suggest this to her so that if she agrees, I’ll get in touch with a guide or companies that offer this activity right away.